Sites funéraires et mémoriels de la Première Guerre mondiale (Front Ouest) is part of the Tentative list of France in order to qualify for inclusion in the World Heritage List. "You want to go where?" my aunt asked me. "La Grande Tombe de Villeroy, it's just next to Meaux, we can pass it on our way to the airport." You need to know my mother's family is from Meaux, a town East of Paris. And indeed when coming from the East (Epernay) and heading to the world's worst airport (Charles de Gaulles), you pass within a few kilometers of the site. My aunt asked again what precisely I wanted to see there. "A Nécropole, must a big thing" I said. Now my French is okay, but not perfect, so my aunt was trying to make sure she didn't misunderstand me. Eventually, she accepted that I meant the tomb. But she corrected me: "It's not a big thing, it's a small sign along the road." I couldn't quite fathom this information (Nécropole, Grande Tombe? ), so I quickly googled the site and indeed: La Grande Tombe is pretty tiny. Most people in nearby Meaux wouldn't even know about it. But thanks to an inquisitive friend my aunt had been before and was able to counsel against a visit. Instead we stopped in Dormans on our way to the airport. Dormans was my second site of the serial nomination. I had been to the cemetery in Arras just next to the Vauban fortification a year prior. 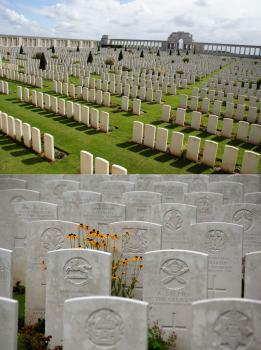 In Arras you will find a simple toned down cemetery. Dormans is different, already signified by the address: Avenue des Victoires (Victory Avenue). The site itself lists all the corps, armies, generals, ... having fought in and having won the two battles of the Marne. And commemorates all the fallen French who gave their lives. The architecture is also more prideful: a big tower on a hill. Initially I thought this would be a shoo-in for inscription in 2018. Instead the decision was adjourned by two years. As I understand it the rationale for adjourning was that the sites were still too glorifying of war. Of the two sites, I feel the cemetery in Arras would be a fine addition. The Memorial in Dormans meanwhile would not be: It's really not a neutral monument to the victims of war, but a nationalistic monument for the victory in key battles of the war. Similar, I fear that Verdun, Compiegne, and the Somme are too related to key victories of the war to really separate the nationalistic component of the memorials from the commemorative one. Personally, I would favor a streamlined inscription focusing on the less nationalistic parts, especially those where soldiers of both sides are buried. In any case, next time I am in the area, I will visit more. Travelling in Northern France you will be hard pressed not to run into one of the sites. Lens has several components in the proximity. If you are travelling from Paris, Compiegne seems a good choice. It will also offer you a glimpse into a royal palace and the train wagon where the armistice was signed. The sites related to WW1 are of great universal significance. The conflict had a huge impact not only for the people who were involved in it but also for all mankind. It took human people from the era of artisanal and local war to industrial and global war. The site also embodies the need, following the conflict, to honour and remember, on a large scale, those who fought and suffered. For the first time, anonymous fighters were honoured as much as famous heroes. I have visited sites in Verdun, Somme, Chemin des Dames, Westhoek and other parts of Belgium. To me, the most striking testimony of the conflict is around Verdun. The whole landscape around the city has been modified by the conflict, from fully destroyed villages to forts, from forests in which traces of bombs are still visible to cemeteries. The cemeteries and memorials of World War I are on the list of missing sites on this website (no. 50), and I also voted for them. Back then my vote was based on information from articles and TV documentaries and on a visit to Verdun at the age of 16. In 2015, I had the opportunity to visit some of the proposed sites at two occasions: a revisit to Verdun in April and several sites near Reims and Amiens on our trip through northern France in September. The French part of this transnational site comprises 80 elements evenly distributed along the line of the western front from the Belgian border to the Vosges. Actually the list is more than twice as long because a lot of the locations are further divided into sub-locations. The selection was made from more than a thousand potential sites and some principles are apparent: a) the geographical distribution, all regions along the course of the front are represented; b) the variety of sites: huge national memorials but also small monuments dedicated to individual persons or certain events; cemeteries of all sizes, some with only a few dozen graves and others with an inconceivable number; c) all involved nations are represented. The commemoration of all victims is equal irrespective of nation, race, creed or military rank, the graves and engravings of names are uniform. But there are differences between the nations in the style of the cemeteries and graves. Certainly, the most striking difference is that the crosses of German cemeteries are black or dark gray, made of stone or iron. The memorial sites of the Allied Powers are in white. The Red Zone of Verdun (53a-f) - Verdun was one of the longest battles of WWI and is a symbol of the futility and horror of an endless trench warfare. Today it is also an important symbol of the Franco-German reconciliation. The forests around Verdun are full of remains of the battle: trenches, forts and bunkers. They still find munitions and artillery shells or skeletal remains, like during the new construction of the Verdun museum. Six locations were selected for this nomination. 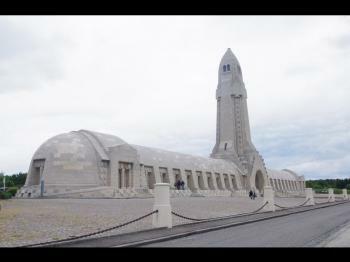 Apart from the importance of the Verdun site, the Ossuary of Douaumont (53a) is also an architectural gem. It is a 140-metre-long building with a central tower, the interior is a vaulted hall with memorial stones and grave slabs. The main ossuary is on the lower level, where chambers are filled with remains of at least 130.000 unidentified French and German soldiers. This part is not accessible, but the bones can be seen through small windows on the back of the building. You have to pay an entrance fee to climb the tower and to see a film about the Verdun battle. 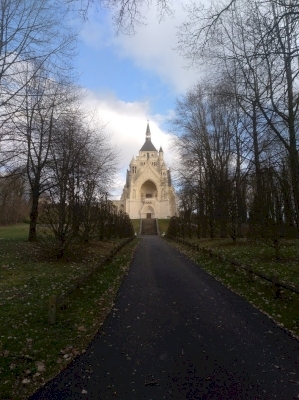 From the top of the tower you have a nice view on the French cemetery (53b) on the slope in front of the ossuary. The site further comprises a Jewish (53c) and a Muslim (53d) memorial, located at the edges of the cemetery. One kilometre northeast is Fort Douaumont (53f), one of the rare memorials that also includes battle grounds. It is part of the nomination mainly because there is also a cemetery within the fort, a few hundred Germans were buried in a walled-up casemate. Finally, the ruins of the Village of Ornes (53e), one of the villages that were destroyed in the Verdun battle. The ruins of the church and a new memorial chapel can be visited. The Monument of the Marne Victory in Mondement (44) - between Provins and Reims, a 35-metres-high reddish monolith, the main relief depict the commanding generals of the first battle of the Marne. Not typical for the memorials that we saw later on the trip. The German cemeteries in Veslud (27) and Saint-Quentin (28) - two examples for the style of German cemeteries: unadorned black crosses under tall trees, there are no flower beds or trimmed hedges, it is more like a forest and differs from the cemeteries of the Commonwealth or the US which are reminiscent of gardens or parks. Rancourt (17) - next to each other a French (17a, with a chapel 17b), a British (17c) and a German (17d) cemetery, but not exceptional, we stopped in Rancourt because it was on our route to more interesting sites in the Somme region. The British one is a good example of a small-sized cemetery with only a few rows of graves. Longueval (16) - the South Africa National Monument (16a), an arc-shaped structure between tall trees, behind the archway is a museum that commemorates the dead of the two great wars and the Korean war. Opposite is the Deville Wood Cemetery (16b) (lower photo), here we saw for the first time typical elements of all larger Commonwealth cemeteries: neoclassical structures with pillars, the Cross of Sacrifice, and the Stone of Remembrance with the engraving "Their name liveth for evermore". In the area are more cemeteries (16c-16h), most remarkable the London Cemetery (16g) with a memorial made of red bricks. Battle of the Somme (14) - one of the most extensive sites with 12 sub-locations. The Pozières British Cemetery (14k and l) is really exceptional and was one of my favourites. It is located just outside of Pozières on the road D929. We were really surprised as the striking gateway suddenly popped up at the roadside. The cemetery is surrounded by walls and colonnades on all four sides (upper photo). The wall panels list names of more than 14.000 soldiers. Next we headed to the Thiepval Memorial to the Missing of the Somme designed by Edward Luytens. The memorial dominates the area and can be seen from afar. It is certainly one of the most important and most impressive memorials of this nomination: a huge arch, actually a complex of arches, with the names of more than 70,000 British soldiers who got no individual grave stone. There is also an information centre. A few kilometres northwest, The Beaumont Newfoundland Memorial (14a-14e), a kind of park with a number of memorials and small cemeteries, the memorial also includes preserved trenches, less interesting in my opinion. Lochnagar Crater Memorial (15) - a mine crater turned into a memorial, British special forces dug tunnels under a German fortification and blew it up. Villers-Bretonneux Australian National Memorial (18a) and Cemetery (18b) - another impressive site designed by Edward Luytens. Two pavilions form the entrance of the cemetery, several rows of graves in the gently rising slope and the memorial on the top of the hill: a tower and surrounding walls with names of thousands of missing dead without individual gravestones. From the top of the tower you have a wonderful view over the grounds and the surrounding countryside. The Départment Somme is characterized by these cemeteries and memorials, it is a rural area with meadows and fields as far as the eye can see, and almost no industrial plants. It was a sunny September day when we visited the Somme region. We saw only bright colors - blue sky, green grass and white stone - which gave the whole scenery a particular beauty, if that can be said about war cemeteries. Though we visited only a small part of the serial sites and sub-locations, I think I have got a good idea of the variety and quality of this T-List entry. The most impressive sites were Verdun, Thiepval, Pozières and Villers-Bretonneux, but I would recommend to visit also some of the smaller cemeteries like in Logueval/Deville. I liked best the design and architecture of the British and Commonwealth cemeteries with gravestones of white Portland stone. But the German cemeteries have also a special and different atmosphere. Of course, the selection can be discussed: how many sites are appropriate to represent a serial nomination? Which sites should be included? The important national memorials and large cemeteries are quite obvious selections, but for many of the smaller cemeteries there would also be alternative choices. I hope this does not raise objections by ICOMOS or the WHC that would lead to a deferral of the inscription. Our visits confirmed my initial assessment: the WWI memorials and cemeteries are a missing site and would be a worthy WHS. I especially liked that undue nationalism and hero worship were largely avoided, the focus is on the commemoration of the victims of all nations. One of the most moving moments was as I noticed that Christian crosses, a Star of David and an Islamic symbol were next to each other in the same row of graves.